Whether you’re pouring another glass of wine or dancing to “Jingle Bell Rock,” Christmas is the season to party. A solid Christmas party requires three things: good friends, loud music, and the best Christmas party foods. Gone are the days of cheese trays and crudite platters, so we’ve provided some ideas to help you throw the best Christmas party yet. This classic combo isn’t just for Santa Claus. Adults and kids alike can all agree that milk and cookies are one of the best holiday goodies. To make this treat work for a party setting, set up a milk and cookie decorating station. Fill a table with different colored frostings, sprinkles, and cut-outs of homemade sugar cookies. Short on time? 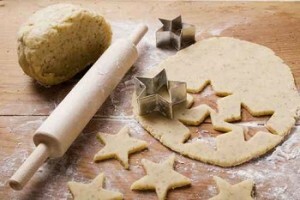 Simply buy sugar cookie dough from your local grocery store, or pick some up the bakery. For an added bonus, offer the grownups an “adult” version, offering White Russians in place of milk. Merry Christmas, indeed. Peppermint bark screams Christmas. With it’s festive colors and minty flavor, peppermint bark is one of those Christmas party foods that both looks and tastes just like the holiday season. 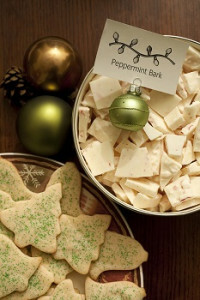 To make peppermint bark at home, simply melt 2 pounds of white chocolate in a double boiler. Once the chocolate has melted, add about 1 cup of crushed candy canes and stir to combine. Pour the mixture onto a parchment paper-lined sheet tray, and refrigerate for 45 minutes or until firm. Feel free to get creative and use dark or milk chocolate as opposed to white. You can also sub out the mints for dried fruits and nuts and make cranberry-almond bark, or even pistachio-apricot! The options are limitless. These adorable cupcakes are simple to prepare and can heighten the appearance of any dessert table. Prepare your favorite chocolate cupcake recipe to serve as the tree’s “stump” and allow to cool. Meanwhile, prepare a buttercream frosting by beating ½ cup of softened, unsalted butter. Add 2 cups of sifted powdered sugar and blend until incorporated. Beat in 2 teaspoons of vanilla extract and 2 tablespoons of milk. Pour the frosting into a piping bag, and frost thick swirls on top of the cupcakes. Sprinkle with green sprinkles and top with any other desired garnishes. Red velvet cake is popular throughout the entire year, but it’s red color makes it especially perfect for the holiday season. To make a batch of cake truffles, bake the red velvet cake either from scratch or from the box. Once the cake is baked and cooled, crumble into a large bowl, and add one 1 cup of store-bought or homemade cream cheese frosting. Roll the mixture into balls, just a bit smaller than a golfball, and place on cookie sheets. Melt 3 bags of colored candy melts (red, green, or white for Christmas! ), according to the packet’s directions. Dip each ball into the melted candy, and place on a cookie sheet. Decorate with colored sugars or sprinkles before the candy coating dries. For plating, arrange these Christmas party foods on colorful plates or stack on a tiered centerpiece. Not only do these treats taste delicious, but they make for excellent home decorations. 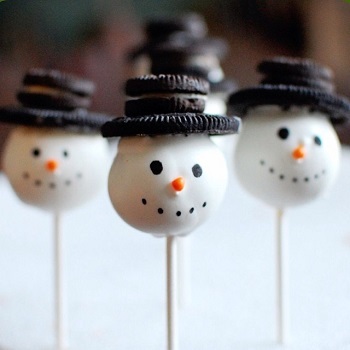 If you’re really feeling crafty, decorate the truffles as favorite Christmas characters and serve them on skewers for a holiday cake pop.